No Rating (-) Watch for signs of instability like recent avalanches, cracking, and audible collapsing. Avoid traveling on or under similar slopes. No Rating (-) Watch for signs of instability like recent avalanches, cracking, and audible collapsing. Avoid traveling on or under similar slopes. 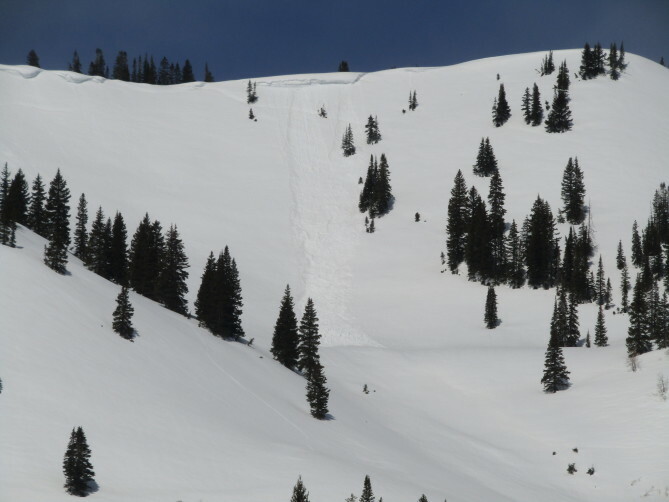 You will find generally safe avalanche conditions exist on most slopes today. Another cold, clear night and increasing cloud cover this afternoon should keep most wet avalanche concerns at bay again today. 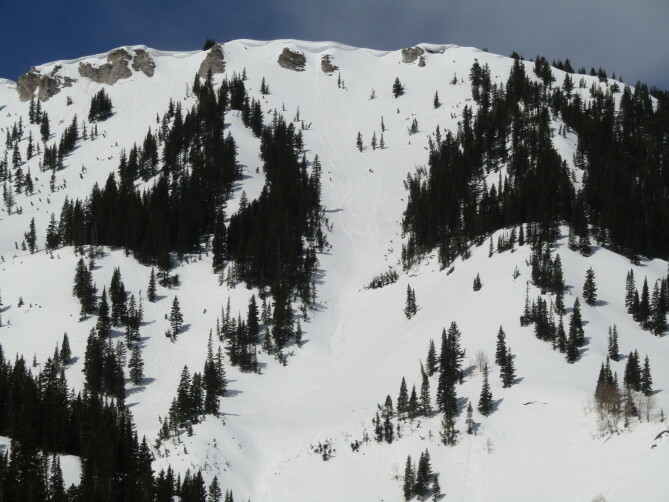 You may be able to trigger small Loose Wet avalanches on very steep slopes as daytime temperatures climb, but these will generally be small and easy to manage. Watch for slopes that get ample sun before the clouds move in and have thin snow cover with exposed rocks and vegetation; you will be most likely to find these conditions here. Spring conditions change very quickly, don’t be afraid to cut a trip short if you find conditions are different than you expected. The large cornices that developed all winter long are still causing concern as they lose strength and weaken. Limit your exposure on slopes below them and stay well back from the edges. Mostly clear skies and colder temperatures overnight with cooler daytime highs will keep most wet avalanche concerns at bay for today. Strong radiational cooling gave us another solid freeze at the snow surface this morning, and increasing cloud cover throughout the day will limit daytime temperatures and solar input. This recent daily cycle has been quite optimal for keeping wet avalanche issues limited, at least for the short term. Lower elevation slopes that face east and southeast may begin to warm this morning before the clouds build, continue to assess localized conditions. For the Central Mountains, the incoming storm will favor the eastern side of the Sawatch Zone. Although storm totals will be light, with favored areas picking up 4-6 inches, winds will be strong enough to form small wind slabs near and above treeline. You may begin to see these develop as early as this afternoon, increasing in likelihood throughout the day tomorrow. Winds will be from the east to northeast where snowfall is expected to be heaviest, drifting snow onto slopes that don’t typically see wind-loading. The large cornices that are lurking about upper elevation ridgelines continue to lose strength as the spring progresses. The threat of large chunks of cornice breaking off increases as water begins to percolate through and perforate them. Limit your exposure by not lingering on slopes below and staying well back from the edges.